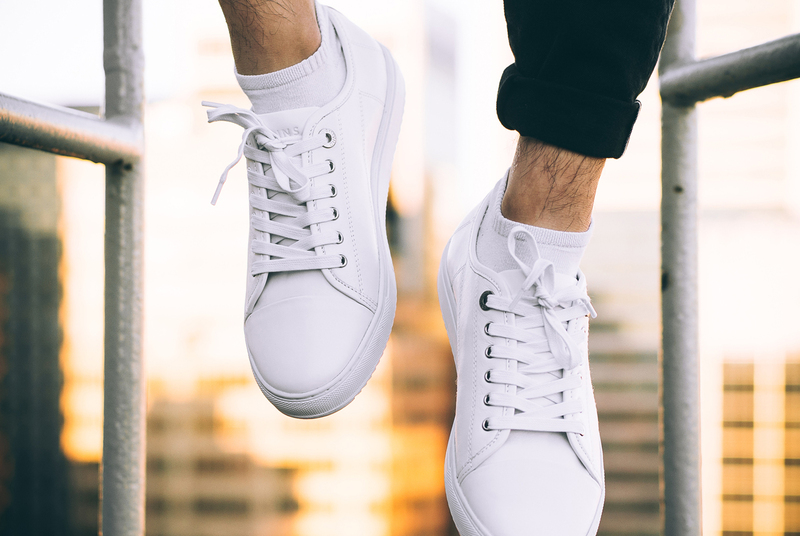 The classic low-top lace-up sneaker, as popularized by brands like Lanvin and Common Projects, have become the go-to sneaker for any outfit ranging from extreme casual street wear looks, to the understated shoes of choice when it comes to the smart-casual look. This footwear silhouette is available from practically every shoe brand under the sun, but choose the right shade, and your sneakers will match virtually any outfit you throw at them. We show you the foolproof colours. As black and white are technically shades, and not colours, all black or all white sneakers will pair nicely with practically any outfit. If you’re changing up your wardrobe for fall and wearing rich deep tones like brown, navy, burgundy, and olive green, then a tan or beige sneaker is your best choice. The tan/beige colour is understated and crisp, but it also meshes nicely with all fall tones. Note: careful with your darker denim jeans. Pin-roll your jeans to the ankle to avoid transfer of the indigo dye onto your precious kicks. Keep your kick-game on point with lace-up low-top sneakers no matter what outfit you wear.